New study looks at how to succeed in a rapidly evolving automotive market. Nano-nano, as Mork might say, these days. 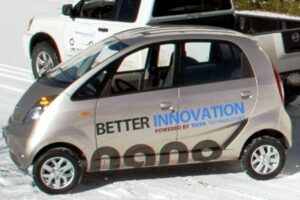 The $3,000 Tata Nano is an example of the challenges faced by makers trying to succeed in the BRIC markets. They may still be considered “emerging” markets, but China alone hs already laid claim to being the world’s largest automotive market and, according to a new report, just the four so-called “BRIC” countries alone will soon account for a full one of every three global car sales. Competing in Brazil, Russia, India and China won’t be easy, warns the study, by he Boston Consulting Group, but carmakers and suppliers who try to survive in only the major industrialized markets will find it increasingly difficult to survive. In 2007, those four countries generate sales of 15 million passenger cars. The number srged to 19 million last year, even as the developed markets of North America, Europe and Japan saw sales tumble. By 2014, the BCG study anticipates BRIC volumes will rise to a collective 25 million, while the industrialized markets will barely recover to pre-crisis levels of around 55 million. So, while there are barriers to entry, Mosquet stressed that manufacturers have to find a way to compete in the four booming countries – and a number of other potentially powerful automotive markets, such as Iran and Indonesia, sometimes referred to as the BRIC+5 or BRIC+7. “For those who still ask if you can avoid China, you can’t,” Mosquet said he tells clients. But the study reveals that simply selling your products in the BRIC – whether cars or car parts – isn’t necessarily enough to ensure a strong, competitive position, Mosquet cautioned. In fact, it will require an approach that runs counter to the current Conventional Wisdom, which holds that manufacturers need to develop so-called “global” vehicles. There’s a place for those, Mosquet suggested, but he emphasized that, “Players who are more local…will benefit” by being able to target the very specific needs of the individual BRIC countries. The market in India, though nearly as large as China, for example, is very different, and a product well-targeted to the subcontinent, said Mosquet, is the new Tata Nano, part of an emerging class of stripped-down microcars that are priced in the $3,000 to $4,000 range. “There is no (single) BRIC car,” noted BCG’s Munich-based Nikolus Lang. Meanwhile, he said the days are over when Western makers can ship an outdated product to the BRIC – as Volkswagen did with its ‘80s-era Santana – and hope to compete. While consumers in countries like China and India may not be able to spend as much as Western motorists, they nonetheless expect modern products. But BCG’s forecast predicts that all four markets will grow for the foreseeable future, even if China can’t maintain the torrid, 42% gains of 2009, which were encouraged by hefty incentives from a government hoping to avoid the downturn in Western markets. As part of the 3-year study, the Boston Consulting Group examined the practices and performance of 50 major companies operating in the BRIC, including 20 automakers. Of that group, it found only two that truly have understood the challenges and adopted business practices likely to ensure them success: Volkswagen and General Motors. And the payoff, said Lang, is that, “Those companies have achieved…really huge market share.” VW and GM, for example, are locked in an ongoing battle for the number on spot in China. On the supplier side, two automotive partsmakers, Germany’s Bosch, and the American Delphi, have generated similar success. That might seem surprising, the BCG analysts acknowledged, particularly considering that Detroit-based Delphi only recently emerged from torturous 4-year bankruptcy reorganization. But as part of that process, the supplier has developed a significant local engineering and design presence in the BRIC, while shifting focus on traditional, low-margin parts to high-reward components, with an emphasis on electronics. While the BCG study looked out only until 2014, there’s little doubt that the BRIC markets will continue growing well into the future, asserted Mosquet. He noted that in the U.S., there’s about 1.2 cars on the road for every licensed driver. In China, it’s measured in the cars per hundred drivers. So, even if the increasingly prosperous nation where to reach a point where there was a vehicle for just every other driver, that would create demand for about 300 million more automobiles than are on the road today. It’s just a question of how fast they’ll be added to the Chinese fleet. This entry was posted on Thursday, January 21st, 2010 at and is filed under Automobiles. You can follow any responses to this entry through the RSS 2.0 feed. Both comments and pings are currently closed.